Guess what? 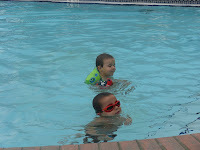 Braden can swim all on his own! 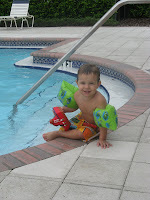 The last few times we went to the pool he was asking me if he could swim with out his floating device and so I let him. He would mostly just hop around. Well I guess it was just the fact that we had gone swimming every day this last week, and maybe he saw his cousins swimming around but one day he just started swimming. He cannot doggy paddle yet, but he is definitely swimming underwater. Hurray for Braden! 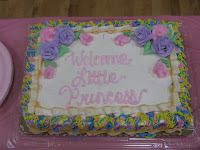 Yesterday I had a wonderful baby shower. 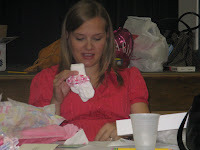 All of my friends and some family came to shower with me with gifts for little baby Brooklyn Claire. I got so many cute things and I am so excited for her to be born so I can dress her in them. I have so many wonderful friends here and I love them all. So thank you ladies for just being there for me! So this Saturday it rained and rained and rained. I love the rain, but, it was sad because Barry is home on Saturdays and we usually go out and do stuff but we were stuck inside all day. So we just played and rested and relaxed. 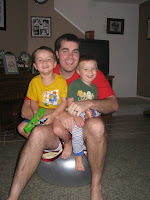 Barry and the boys got out the big exercise ball, we don't use it for exercising just playing, and they bounced on it for a while. It turned out to be an okay day after all. Barry and his brothers are so close. He loves them all very much. 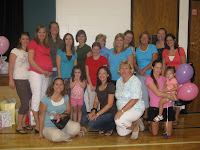 We just recently got together with the Pope's and all Barry's siblings were there except for Virginia :( but it was still fun. 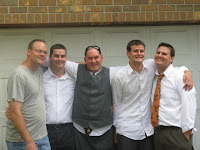 We took a brother's picture, which we haven't been able to do in 4 years because Ben was gone on a mission, and then Jeffery was gone on a mission. So here is the Brother's picture. They're a great looking bunch of guys Huh? I hate it when my boys are sick! The boys have been sick lately. it is no fun. 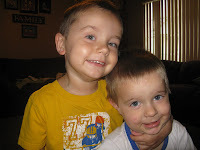 Lincoln got croup and it turned into a cold, and now both Braden and Lincoln have the nasty cold! I am so tired of being at home! We haven't been able to go out and play because their noses are faucets and they can't stop coughing! No fun! but at least they are still as cute as can be! So I was talking to my mom the other day and she said to me, "I haven't seen any cute pictures of my pregnant girl lately!" So I wouldn't call myself cute, but here is a picture of myself for those of you who were wondering how gigantically huge I've gotten! We recently had Lincoln's pictures taken for his 2nd birthday and we got them back today. I cannot believe how grown up he looks. He is not my little baby anymore. He is huge. 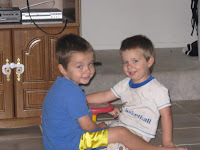 I am so blessed to have two wonderful little boys. They can be challenging at times, but they are so much fun. 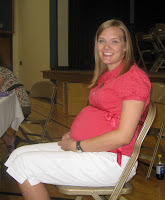 Barry and I were married in 2003 in the LDS Nauvoo temple. We have 3 kids. Braden is 6, Lincoln is 4, and Brooklyn is 1. We are currently living in Dover, Florida. Barry works for Tampa General Hospital as an applications manager. Kassi stays home with the kids, while trying to finish her degree.